The TRS grid is defined soon after the Constitution is established. 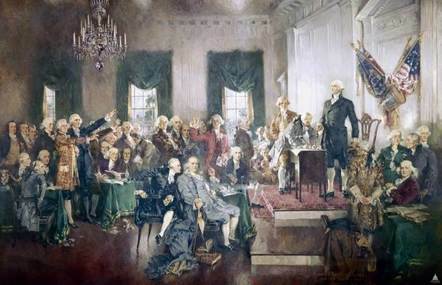 Congress turns its attention to the construction of the Constitution to deal with issues of personal liberties and the creation of a Government to run things. With two years of additional debate on September 17th, 1787 Congress passes this “Act” into law as the founding and Supreme Law of the New Nation that is to be known as The United States of America, and it’s Government from this day forward. The revolutionary land idea was so important that the practical details of how it would work were hammered out first. The Founding Fathers established the Rectangular Surveying Method with TRS Grid details as the legal and approved method to survey. This method describes, locates the land, and allows the Federal Government to distribute by “Patent" to others, thus establishing and protecting property rights. The Tallahassee meridian (adopted in 1824), in longitude 84° 16′ 37.59″ west from the prime meridian at Greenwich, runs north and south from the initial point on the base line at Tallahassee, in latitude 30° 26′ 04.12″ north, and as a principal meridian governs the surveys in Florida and Alabama as part of the Public Land Survey System. The term "Tallahassee meridian" is also loosely used to describe the survey monument located at the intersection of these lines of longitude and latitude (the longitude line being the "Tallahassee meridian" and the latitude line being the "Tallahassee Parallel" or “Tallahassee Base Line”). This survey monument serves as the initial point for U.S. government surveys in the state of Florida. The survey monument for the Tallahassee meridian can be found in a side yard east of a government building located at 411 East Bloxham Street, Tallahassee, Florida. An American flag and war memorial monuments are also located there — otherwise the monument could be easily missed. 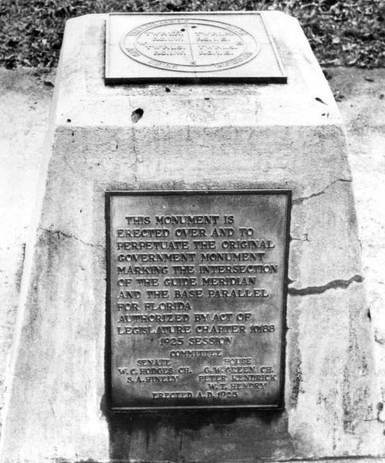 The monument originally marked the southwest corner of a section of land given in gratitude by the state of Florida to Marquis de la Fayette — his lands being part of Township 1 North Range 1 East, also identified as T1N R1E, 1 North 1 East, or 1 N. 1 E.
3-6. During the period since the organization of the system of rectangular surveys, numbered and locally named principal meridians and base lines have been established as listed in the accompanying table. These bases and meridians are shown on the large wall map of the United States published by the Bureau of Land Management, on a special map entitled "Principal Meridians and Base Lines Governing the United States Public Land Surveys" published by the Bureau, and on the various State maps and topographic maps published by the United States Geological Survey. 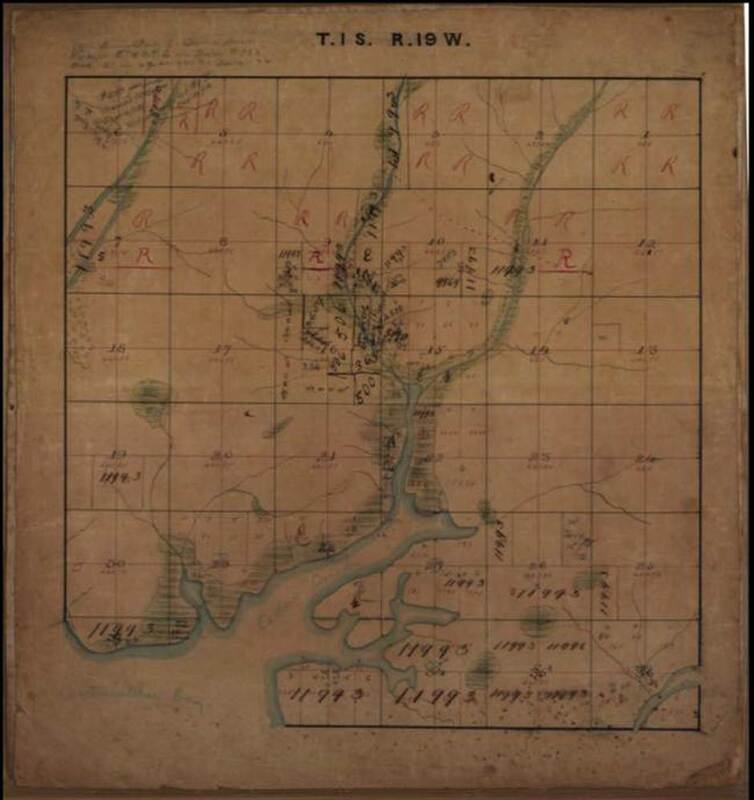 Top left - township & range grids originating from the location of the juncture of the Tallahassee meridian and parallel. 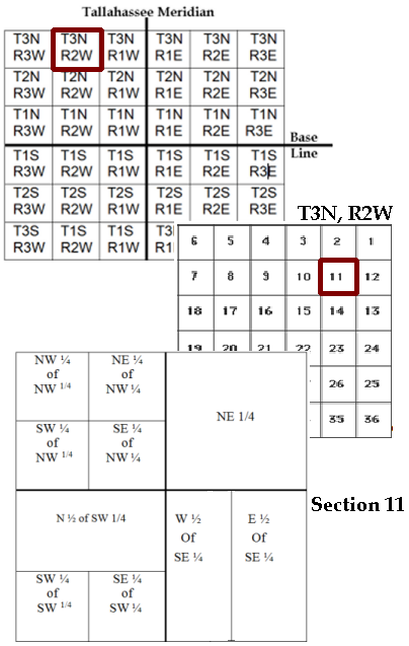 This “code” or numbering system is part of the TRS (Township Range System), and it is an interregnal part of the Rectangular Surveying Method and the basis for the Public Lands Survey System, [PLSS]. Each box measures 6 miles by 6 miles and contains 36 1 mile by 1 mile squares called Sections. Center right - an example of a Township with the 36 one mile by one mile squares that make up a TRS grid. Interior portions of a Township can have four sections with one corner in common represented by a form of monument placed by the GLO. Monuments placed in 1 South 19 West were light wood stakes with squared tops. Light wood was preferred where the resin in conifers concentrates in the base of the tree. If a pine is cut down or dies by disease or storm, the pine resin will harden and preserve the wood. Light wood stakes were used since they did not deteriorate the same way wood normally does, due to a high content of resin. Bottom left - an example of how a one mile square Section is divided up and dispersed by patents from the Federal Government to States and individuals. A section of land . equals 640 acres, and is a one mile by one mile square of land. One mile is 5,280 feet long. Early surveys were measured by 66 foot chains and 1 mile is equal to 80 chains. All TRS grid lines are straight (no jogs or curves) by Law except in Fractional Townships. Descriptions from TRS grids are the root of all deeds in the state of Florida. 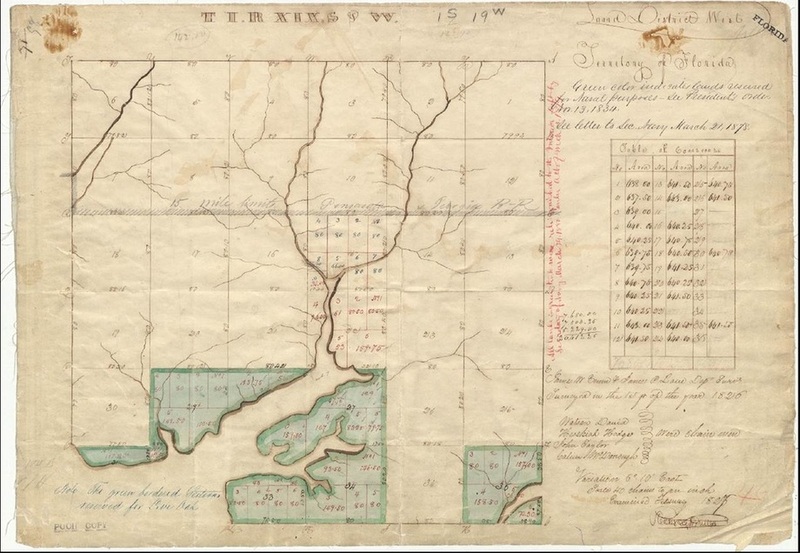 On May 20th of 1785, by an act of the United States in Congress, our Nation adopted and codified the “Rectangular Surveying Method” containing the Township, Range, and Section (TRS). Eventually, every township in Florida was Federally surveyed by the Government Land Office (GLO) using the rectangular survey system that was adopted by Congress. In Florida, the TRS grid system began in 1821. In Walton County there are 43 such townships, and hundreds more in other counties across the State. Townships are arranged side by side in lines and up and down in rows . All townships have their own unique code as a name, originating from location of the Tallahassee meridian and base parallel. 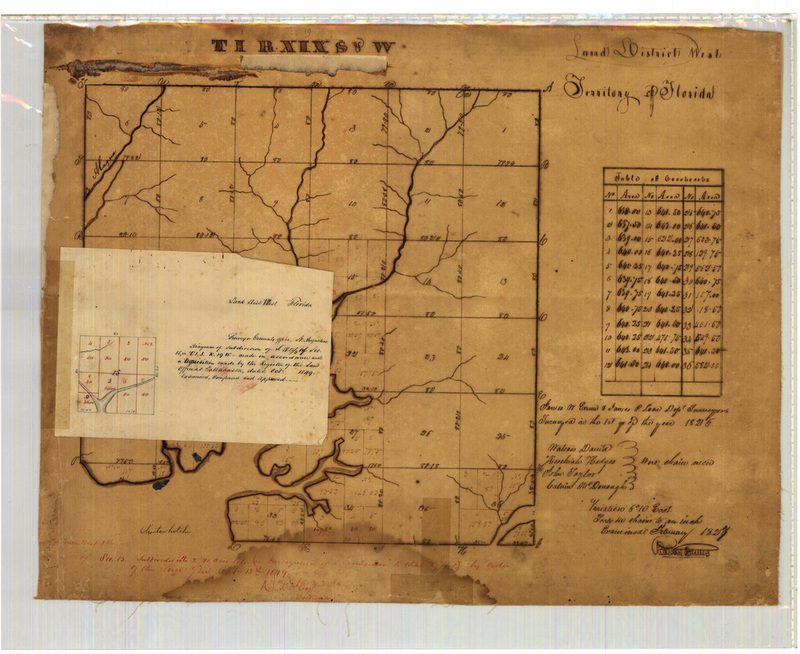 The “Plat” or drawing of each survey, along with the field notes are archived into the public Federal records of the United States, and on file with each State where the GLO survey was made. Some Counties also have copies on file in their public records. The Florida Department of Environmental Protection and the Bureau of Survey and Mapping has established the Land Boundary Information System, or LABINS, which is a source of considerable information for researching survey and mapping documents. The basic strength of the rectangular surveying system, the PLSS [public lands survey system] and the TRS [township range section] Grid resides in the fact that permanent interrelated corners are monumented into the ground, documented by measurements in the field books, depicted on plats, and referenced for future identification. These references established by the Federal Government control the lines, and they are unalterable. [see “Clark’s on Surveying and Boundaries 7th Ed. Pg. 112 4.06. Monuments). This sub license known as Statehood is similar to having a drivers license, which could be described as a drivers contract with the State. To obtain one, you have to learn the rules. prove you known them, agree in writing to obey them, and agree that if you do not obey - you can be punished. Your license is a privilege, is conditional, and you must obey the rules at all time so you can legally drive. That is also why it’s a contract where both sides agree to do something with terms and conditions and there is consideration (the exchange of something of value). The Territory of Florida engaged in a contract with the Federal Government to become a State. The Acts of Congress, and the terms and conditions of the sub license or contract for statehood includes an overseer to maintain the accuracy of the TRS Grids. The terms specifically called for a County Surveyor in each county established to oversee and protect the TRS grids. . These plats were created by the State Land Office to visibly track original land sales out of the the State by original patent and currently are on file at State Department of Environmental Protection (DEP). These lands were designated lands granted to the State of Florida by Acts of Congress and therefore available for the State to sell. They are provided here for informational purposes only and the user is cautioned that they do not reflect the current status of state conveyances. The numbers shown on these plats relate to the parcels shown on the State of Florida Tract Books (SFT) found in the Board of Trustees Land Database System (BTLDS).